When to Switch Puppy Food to Adult Food? 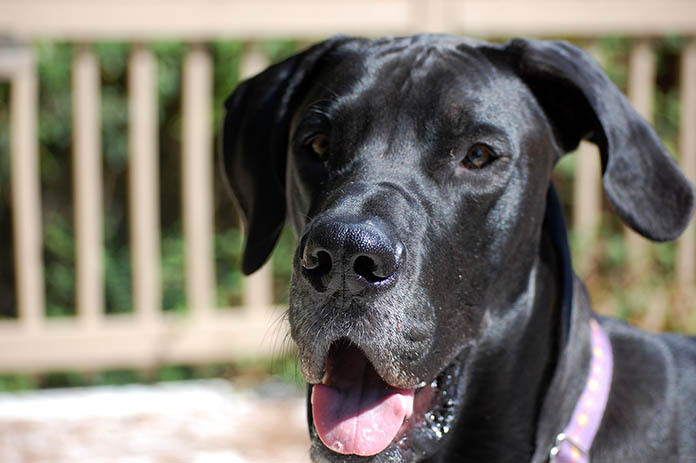 Often called ‘gentle giants,' Great Danes make truly great companions. This breed is also commonly referred to as the “Apollo of the dogs”. The comparison to Apollo, the athletic, forever young Greek god-protector from evil reflects on the nature of Great Danes perfectly, capturing their affectionate, kind nature and noble appearance. It is almost impossible to believe that originally this breed was created to hunt wild boar – although modern Great Danes have very little in common with their ancestor. Their size and powerful bark won’t fail to scare a burglar, however – or, in fact, anyone who is not too familiar with Great Danes’ sweet traits. Although there are numerous advantages of keeping a Great Dane by your side, it’s important to bear in mind that certain aspects of taking care of such a large dog can get tricky at times, nutrition being one of them. Imperfect Great Dane diet may potentially cause a myriad of health issues. We are pleased to share a few important tips to make sure you are providing your beloved companion with the best dog food for Great Danes possible. Caring for a Great Dane puppy is an exciting journey, which requires a bit of extra attention, compared to some other breeds. 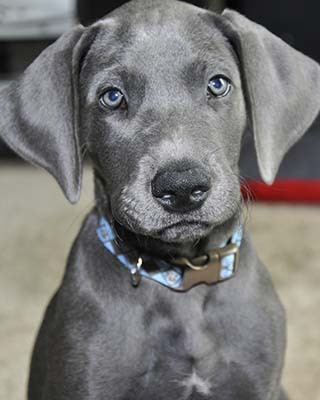 Proper diet will give your pet a good start in life, providing the foundation for healthy growth and development, but it’s important to remember that following “general” puppy nutrition rules will likely do more harm than good in case of Great Danes. First of all, Great Dane puppies should be fed at least 2 times a day, preferably 3. Giving all the food in one sitting is strongly discouraged, as it negatively impacts digestion and nutrient utilization. When the puppies begin to lessen their intake at their second feedings, it indicates that you may start transitioning to a more forgiving twice-a-day schedule. It is also critically important to say an outright “no” to any cheap, generic Great Dane puppy foods, at least without thorough research. Most of such formulas contain protein and fat levels way above recommended guidelines for Great Dane puppies, which may have devastating consequences. Overfeeding your growing Great Dane is a terrible idea, and if you strongly prefer chubbier puppies, this breed is probably not for you: excessive weight, even a little of it, puts unnecessary pressure on rapidly growing bones and joints. This may result in severe growth disorders, such as hip dysplasia, panosteitis, and wobbler syndrome. As a general guideline, when handling the puppy, you should just be able to feel the ribs. The guidelines below will help you make the right choice. Protein levels in Great Dane puppies’ diet should not exceed 23-26%. This should be high-quality protein, coming primarily from animal-based sources as opposed to grains or other high carb ingredients. Being overly cautious and not hitting the protein limit is not recommended, as protein provides necessary building blocks for the growing organism. Contrary to popular myth, high, yet reasonable dietary intake of protein within approved guidelines will not lead to skeletal abnormalities – on the opposite side, protein malnutrition will most certainly trigger development problems. Fat content must not exceed 12-16%; otherwise, your pet will likely develop weight issues discussed above as fat is usually the primary source of excessive calories. Remember, overfeeding your Great Dane puppy is basically asking for growth abnormalities, as well as possible heart disease and diabetes in the future. Along with excessive energy intake, a diet too high in minerals may rapidly lead to an abundance of health issues in puppies. The higher the mineral content of the diet is, the bigger shifts in the balance of absorption and assimilation occur, disturbing the normal development process. The most notable culprits are calcium and phosphorous, as puppies receiving those in excess very quickly become prone to complications related to skeleton and joints lesions. A very common yet serious one is H﻿ypertrophic O﻿steodystrophy, or HOD, which as an extremely painful condition, often affecting multiple limbs and causing lameness. Other complications related to high mineral diets include conformation problems and stature abnormalities. The most notable culprits are calcium and phosphorous, As you have probably concluded already, it’s also important to avoid calcium supplementation, as calcium deficiency is an almost non-existent issue if you're feeding Great Dane puppy a correct ﻿﻿Ca: P﻿﻿ ratio kibble. The protein, of course, is derived from premium animal sources too, so rest assured your puppy won’t gain unnecessary weight while on this formula. This food is a very popular choice, and the overwhelming majority of reviews are on the positive side. We are happy with the weight control properties, while the pets seriously enjoy the taste. The specially selected omegas seem to do wonders for battling and preventing inflammation. A few unsatisfied buyers claim it may cause gastrointestinal problems, but those seem to be individual reactions (you’ve probably noticed the theme of rare stomach upset cases with all brands). On the bright side, compared to other brands by reviews, this one seems to have one of the lowest gastrointestinal issues prevalence. Made with high-quality, animal-based proteins to ensure lean body composition and healthy development, this product is a favorite of many Great Dane puppy owners. Featuring amazing ingredients such as DHA from natural fish oil, superior quality fiber and a complex of prebiotics, this food promotes healthy digestion and stimulates learning of your smart little companion. This food helps keep Great Dane puppy weight under control while promoting considerable muscle growth. Puppies also seem to love the taste, which is not surprising, considering that chicken comes first in the ingredients list, meaning it’s the most prevalent component in the formula. A few reviews state that the food makes their puppies gassy, so keep a close eye on your little companion if you’ve just switched to this formula. Bloating in Great Danes is not to be taken lightly, as it’s considered their number one killer. With no corn, wheat, and soy in the ingredients list, alongside with a long list of beneficial supplements such as vitamin A, C & E and balanced omega, this formula seems like a heavenly deal. Phosphorous levels are pushing it a little bit, however, although calcium content is lying safely within recommendations. It’s also worth mentioning that proteins come from 100% real meat to promote healthy muscle growth and lean build. When it comes to reviews, however, this one seems to be a huge hit or a complete miss. While we swear by amazing quality and the taste that puppies seem to love, skeptics refer to a quick escalation of gastrointestinal issues such as diarrhea. As it doesn’t happen to everyone and it’s always hard to pinpoint a single issue when it comes to upset puppy bellies, we’d recommend giving the formula a go. When to Switch Puppy Food to Adult Dog Food? Of course, your Great Dane won’t be a puppy forever, and at some point, the dilemma of transitioning to adult nutrition will arise. Before you reach that point, however, make sure you are gradually increasing the amount of food you provide for your little ones, as until about 12-14 months of age, Great Danes experience the most rapid growth, and during this period they require the most nutrients and energy relative to their size. As for when exactly you should start transitioning, opinions slightly vary. 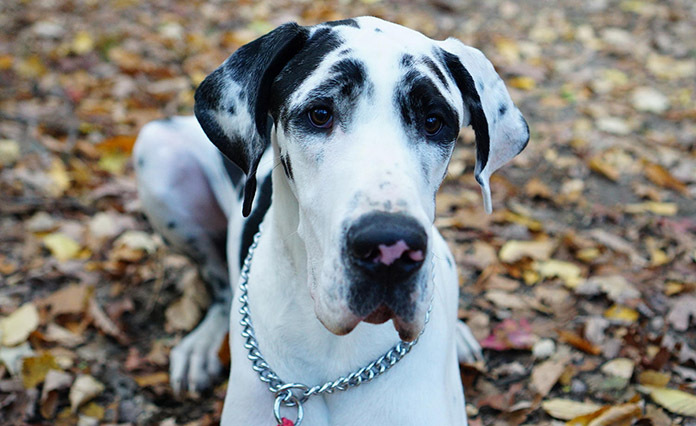 Most often, you’ll come across the recommendation to start switching the formula if your Great Dane has reached 18 months of age, although some people prefer to do so around 12-14 months. The best approach is to keep a close eye on your dog’s growth and judge by his development as opposed to exact time frames. The transition from puppy to adult diet should be smooth and gentle. When the time comes, it is advisable to start mixing in small amounts of the chosen adult formula into the food you would normally use, gradually increasing the presence of the former. The transition usually takes between 5 days to 2 weeks, depending on how well your puppy is accommodating to the changes. Go slower if you notice any otherwise unexplainable signs of gastrointestinal upset, bloating and diarrhea. In general, the longer the transition, the fewer complications you will have. A slower transition is also extremely beneficial as it completely prevents bloating, which, as we’ve mentioned earlier, may be very dangerous. As you’ve become very experienced while raising your Great Dane puppy, you aren’t likely to stumble upon any entirely new issues related to adult nutrition. We even have relieving news here – once your dog reaches about 10-12 months of age, it means the so-called “critical growth period” is behind; therefore you can be a tad less strict with phosphorous and calcium. As a general guideline, still, aim for the levels stated above to stay on the safe side, but don’t worry too much if you happen to slightly exceed them occasionally. Another slight change relates to protein – due to much the same reasons, adult Danes need a little bit lower dietary macronutrients intake compared to little ones. To ensure your companion doesn’t gain unnecessary weight, keep protein at no greater than 24% and fats around 12-14%. When it comes to feeding frequency, make sure you are feeding your adult Great Dane twice a day. Regular feeding promotes healthy digestion and prevents bloat, so make sure to determine suitable feeding times and stick to them. For adult Great Danes, probiotics deserve a special mention. A rule of a thumb is to pick the food that contains probiotics, as they help maintain healthy gut flora, prevent digestive problems and battle bloat. These issues gradually become more important as your dog ages, as the chances of receiving treatment interfering with digestion, such as antibiotics, increase. Probiotics will do the trick in such instance, restoring good bacteria and keeping your friend in his best health. This is one of the best dog food for Great Danes that contains only premium, 100% natural ingredients with absolutely no corn, wheat or artificial colors. Best of all, there are no meat by-products too, and only high quality chicken and pork will make it to your Great Dane’s plate if you stick with this brand. The company takes pride with manufacturing the product strictly in the USA, with superior control at all production stages. As far as the customers’ opinions go, Eagle Pack seems to be a fairly popular choice with mostly positive reviews attached. Apparently, it pleases even the fussy eaters, as even the pickiest dogs seem to dig into it with no unhappy growls. We haven’t found any trustworthy diarrhea/stomach discomfort reports, which is pretty important for Great Danes. You may find a couple of allergy notices, but such individual reactions are hard to predict. Thumbs up, great product! Apart from appropriate macronutrient and mineral ratios (we wouldn’t waste your time for anything less than that, frankly), this product has a number of unusual yet highly beneficial, scientifically approved supplements, such as glucosamine and chondroitin complex for joints and mobility and a myriad of antioxidants. With such composition, it is not surprising that this best dry dog food is highly recommended for middle-aged dogs to support their transition into senior age. At a reasonable price point, this product is very popular and well received among dog enthusiasts. This food has been around for a considerably long time, which is often a good sign. Key advantages include amazing palatability, giving dogs more energy and making their fur shine brighter than diamonds – a must-try by the looks of it. Claiming to provide optimal nutrition for gentle giants after reaching adulthood, this formula appears to be much better received than it’s variation for puppies. Although this food doesn’t appear to be the most popular choice overall, everyone who tried seems to be raving about it. Not only it contains optimal macronutrient and minerals ratios, but the food also features familiar supplements such as omegas and probiotics. The result is glowing health inside and out: healthy weight, smooth digestion, and fantastic coat. There is a downside, though – unlike gentle and friendly Great Danes, the price for this formula bites quite painfully. You can always reduce the cost by ordering in bulk or splitting with a friend, as the product seems to be well worth it. If your dog has considerable digestive issues and/or intolerance, look no further, as this formula has no traces of grains, guaranteed. Coming at a higher price point, this premium food contains the goodness of high-quality proteins, as well as a mixture of vitamins, minerals, and antioxidants. Add quality carbohydrates and fiber derived from healthy vegetables, and you are heading for perfection. Omegas have also made it to the ingredients list to ensure your Great Dane’s coat will stay nice and shiny. The majority of the reviews are strongly positive, as the grain free dog food doesn’t seem to provoke any health issues while providing all the claimed benefits. The rumor has it, though, that the quality has changed a lot recently, although competitors may very well raise it. Also, keep in mind that brand’s signature “small-bite” kibble may not be ideal for large dogs such as Great Danes. Also 100% grain free dog food, this formula promises to meet the nutritional needs throughout all life stages, from puppy to senior years – convenient, isn’t it? Vitamins and minerals for health and vitality, protein blend featuring the optimal amino-acid profile, antioxidants, optimal micronutrient levels – everything seems to be amazing about this unique blend. It also features so-called chelated minerals, which are supposed to assist with digestion. As you’ve probably guessed, such an innovative and versatile formula is quite costly. However, it's stunning popularity and ecstatic reviews make us think it’s worth spending some extra on! Being an optimal source of nutrition, it may also assist in the management of some serious health issues such as seizures and rashes (that is, as a part of a thorough treatment plan, of course). So if you can afford it, this product is definitely worth a try. *Disclaimer: Our review on dog foods is based solely on our personal experience, research, consults with experts/veterinarians and information provided by the manufacturers. We do our best to test as many products as we can, but unfortunately, we don’t have the capacity to test them all. Kindly consider the above recommendations as our opinions. Before transitioning your dog to any new food, we encourage you to consult a veterinarian. Thanks for the list. I’ve feeding my Great Dane puppy the Eukanuba Puppy Food and he’s loving it. I agree that probiotics helps prevent digestive problems. I give it to my dog twice a week for a healthy gut. Taste of the Wild Dry Dog Food for my senior dog and he likes it! Awesome post! Aside from dry dog food, sometimes I give Honey my great dane a fruit like strawberry or watermelon as a treat.